Regulators is a set of the three drones and three regulators (Tenor, Baritone, and Bass) found on a full set of Uilleann pipes (Irish Bagpipes) in the most common keys of D, C#, C, B, or Bb. You may tune the drones and regulators +/- 50 cents in one-cent increments using the "Cents" slider on the settings page. Quickly reset the tuning offset to zero by touching the displayed offset value. The app supports multitouch and independent playing of all three regulators at the same time. You can even touch one regulator key and slide to adjacent keys on the same or other regulators. By touching the regulator mode switch below the drone puck, you may switch between auto-chord and single regulator play modes. In auto-chord play mode, touching on the left side of the regulators plays the tenor+baritone chord and touching on the right side of the regulators plays the baritone+bass chord. 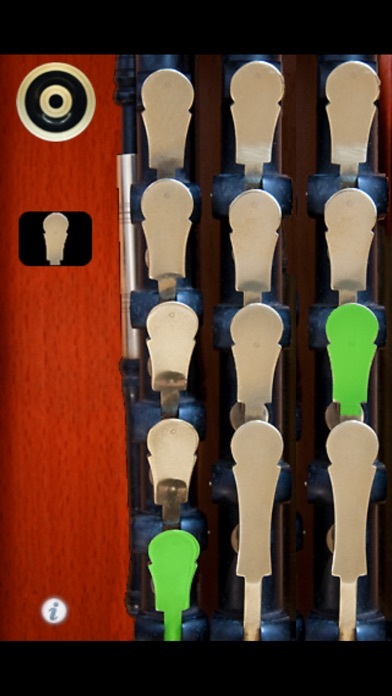 Regulator auto-chord play mode is quite suitable for live performance along with a chanter when strapped to the leg and played with the side of the hand. 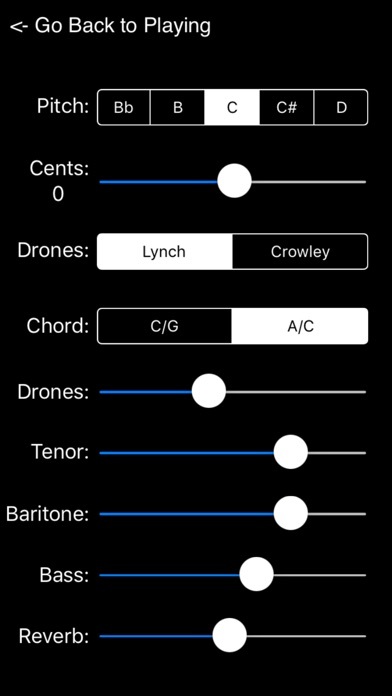 On the settings page, you may set the drones style (Lynch or Crowley), root key (D, C#, C, B, Bb), overall tuning offset, the volume of each of the three regulators and the drones independently, as well as the overall reverb level. All settings are saved when the app exits. Regulators uses 16-bit 44 KHz, seamlessly looped audio samples based on real recordings of instruments, not synthesized tones, so is very realistic sounding. The samples all are tuned using proper just intonation relative to the drones. Regulators may be enjoyed by anyone who wants to add the unique sound of the Uilleann pipe drones and regulators to their live or recorded music. You may now play along with the tunes on your iPhone or iPod Touch, just start the music before running Regulators. Using Apple's Settings app, you may configure your device to bring up the iPod music controls by double clicking the home button to change tracks within an album. Try plugging your device into a large amp and speakers, either via the docking connector or headphone jack to really appreciate the quality of the sound produced by this app. Please visit my website for a video showing how to play along with music in your iTunes library as well as examples of the app used in multitrack recording projects where real regulators weren't available. Also on the website there is a demonstration video showing how to use the tuning feature to play along with historical recordings that may not be at exact concert pitch. Lynch drone samples recorded from my personal set. Crowley drone samples originally provided by Vinnie Kilduff.